In 1999, the New York resident Maurice Ashley became the first African-American International grandmaster. In 2002, he once again made history, by becoming the first African-American to qualify for the U.S. Championships in more than 150 years. In 2003, the U.S. Chess Federation named Maurice Ashley “Grand Master of the Year”. Ever since the late 1990s, Maurice Ashley has been a tutor as well as a player. In 1999, he established the Harlem Chess Center in New York, where he coached young chess players. In 2005, he published the book “Chess for Success” where the explains how chess can be a vehicle for improving overall student achievement. Maurice Ashley is also the main force behind the Generation Chess Competition, as well as the app “Learn Chess with Maurice Ashley”. Maurice Ashley lives in New York City with his wife Michele and their two children Nia and Jaden. Maurice Ashley was born in Kingston, Jamaica on March 6, 1966. His mother left for work in the United States when Ashley was two years old, and he and his siblings were raised by their grandmother. In 1978, Ashley and the rest of the family moved to New York and was reunited with the mother. 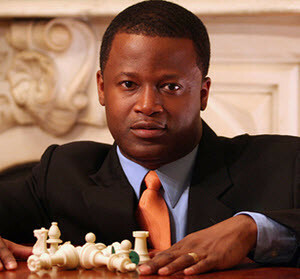 It was in New York that Maurice Ashley began playing chess, when he was 14 years old. He played in Prospect Park in Brooklyn, where his opponents were usually a lot older and more experienced. He young Ashley often staked, and lost, his lunch money on the games. In the year he turned 20 (1986), Maurice Ashley earned the title of national master. Later, Maurice Ashley went on to coach chess at the Mott Hall Middle School, which is also located in Harlem, New York. His team won both the 1994 and 1995 Junior Varsity Championships. In 1997, Ashley took a break from coaching to focus on his own play, since his own game had suffered from his dedication to coach others. His goal was now to become an international grandmaster. This was a goal that he reached in 1999, when he became the first African-American international grandmaster.